The voice-over feature improves the audio quality of a presentation. This allows a writer to add live voices to a story either by recording directly into ScriptVOX Studio or importing audio voice files. 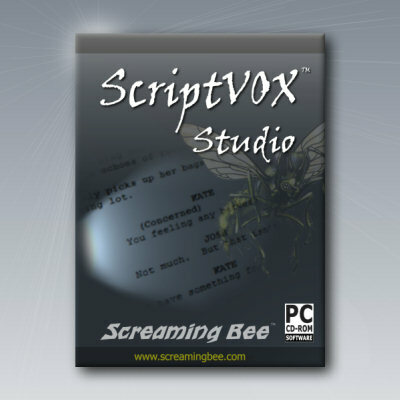 ScriptVOX also maintains synchronization of the voices with the specific lines in a story and directly integrates to Screaming Bee’s other product, MorphVOX Pro Voice Changer. ScriptVOX Studio’s subtitles feature improves accessibility by adding text captions to a story. This is important for readers who may be hearing-impaired and require text captions in place of audio. The subtitles feature is also helpful to early readers or foreign language students who can benefit from the combined audio output and the visual text for learning. The storyboarding tool in ScriptVOX Studio allows writers to conveniently visualize their scripts and screenplays. Combined with ScriptVOX Studio’s file rendering capabilities, a writer can also create an audio or video presentation. New video formats added to this release include high-definition (HD) DVD and YouTube settings. ScriptVOX Studio is designed to bring stories to life. It has the ability to rapidly prototype a story, script, narration, or screenplay. Using Text-To-Speech (TTS) and recorded voices, a writer can create a whole cast of characters for their story or presentation. For more information on ScriptVOX Studio, click here.